Are you a Rotarian wanting to expand your knowledge of and connection to Rotary? Are you going to be an assistant governor or an officer in your Rotary club in 2019-20? Then Rotary Spring Training is for you! In addition to covering the roles and responsibilities of officers, programs will be also be offered in other areas of interest. See the District website for more details and registration. Dates: Saturday, April 27, 2019 in Yuma, and Saturday, May 4, 2019 at the Quail Creek Country Club in Green Valley. Register now! Cost is $12.00, or $10.00 if 4 or more of your club members attend. Taste of Chocolate returns on Sunday, 7 April 2019 at the Doubletree Reid Park. Join Rincon Rotary club of Tucson to help judge a chocolate competition. Tickets are $15. To purchase tickets or for more information, visit www.tucsontasteofchocolate.org. If your club would like to sell tickets, contact wbtus@aol.com. Like to travel? Then get your passport ready because it’s time to consider starting a Passport Club! What is a Passport Club, you ask? Well, just as a passport gives you freedom to travel to different countries, a Rotary Passport Club membership gives you the freedom to visit and work with Rotary Clubs all over the world and take part in activities, programs and projects that interest and engage you. So instead of being stuck in a chair every week at a meeting, you’re out in your community and the world doing great things for others. Sound good? Imagine how it’ll sound to a potential Rotarian. So check it out! Visit our District website at rotaryd5500.org and click on “Membership Development”. 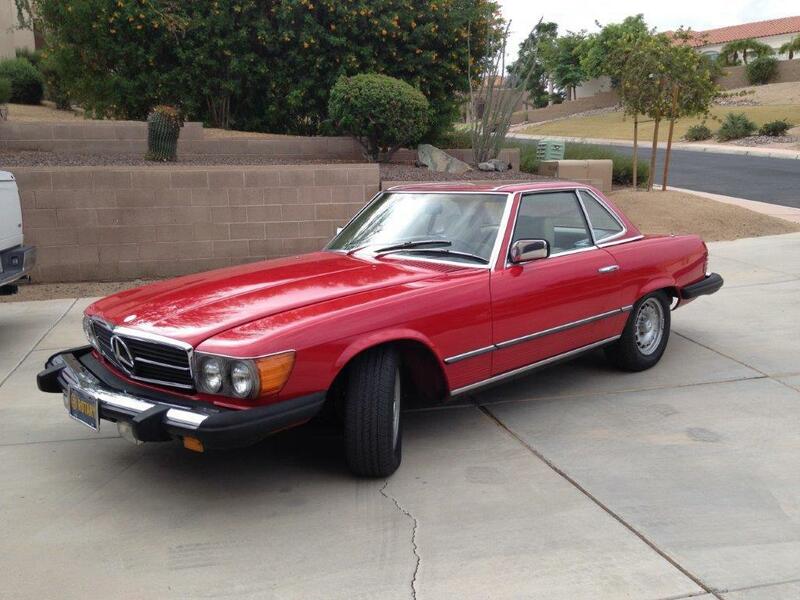 A longtime member of Yuma Rotary passed away recently and left his 1980 Mercedes 450SL to his daughter. She and her husband, who is also a member of Yuma Rotary, have donated the beautiful red convertible Mercedes to the club to raffle off for our youth services fundraiser. The raffle will take place April 9, 2019 at the club’s regular lunch meeting. Tickets are $10 each. To purchase a ticket and support Yuma Rotary Club youth services, please email Page Misenhimer at pageyrc@gmail.com. Casas Adobes Rotary Club held a rummage sale Saturday, February 16th. The first-time fundraiser was a success. The club is also holding a traditional raffle with the grand prize being a week’s stay at a beautiful Kauai, Hawaii condo. Anyone interested in buying tickets can contact Emmet Zimberoff at 520-906-2000 or emmet@zmarkpro.com. The drawing is April 18th. Preparations are underway for the 8th Grade Honor Program Breakfast in May. If you have heard about ShelterBox, you know it is a British based NGO. But did you know it started in the Rotary club of Helston Lizard? The first boxes were sent for victims of the 2001 Gujarat earthquake. 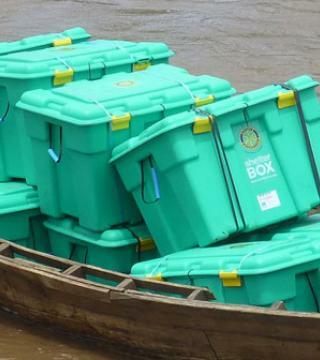 From there, Shelterbox grew in response to the 2014 Tsunami. The Haiti Earthquake required the largest deployment - over 28,000 tents for families in need. Today we have responded in more than 100 countries to 300 disasters. Do you know which country we have deployed to the most? Next month, we will share how Shelterbox decides to deploy. For club presentations please contact donjorgensen@comcast.net. Join us for the Four-Way Speech Contest. Happening on Saturday April 13th, 2019 at Social Hall Christ Church United Methodist (655 N. Craycroft Road, Tucson). The event start time is 10 a.m. and the topic is “Who Has Been or Presently Is an Inspiration in Your Life and How Does He/She Embody The Rotary Four Way Test?” For more information, contact the Four Way Test Speech Chair Debra Haddock, haddockhacienda@aol.com, 520-822-8591 or 520-471-4145. 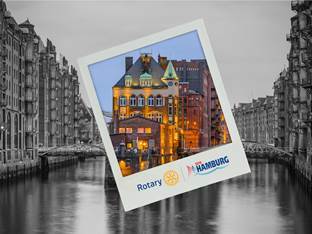 Please join Rotarians and friends in District 5500 traveling to Hamburg June 1-5, 2019 to experience the many opportunities at the annual RI convention. There truly is something for everyone whether you’re a longtime member or you have just joined Rotary. Unforgettable moments are made at the RI Convention, a place where the Rotary spirit fills the air with the highest level of energy and enthusiasm. Discover the unique blend of historic and contemporary culture that makes Hamburg a perfect setting for memorable experiences. It’s a flourishing city with friendly people and many delights that will make you want to return to this beautiful port city again and again. Members of the Green Valley Rotary Club are back in action after the December holidays. At their annual election, they chose executive officers for the next three years: Paul Loomans, Jerry Kriebel, and Bob Auflick. Almost everyone turned out to support the Spaghetti Spree on Jan. 16. Although the final numbers aren’t in yet, it’s estimated that a record 550 dinners were served. Two GV Interactors have returned from RYLA. The third and final major fundraiser of the year is the Spring Bacchanal wine and hors d’oeuvres tasting with live music on March 30. The 2019-20 President and President-Elect sign a Club Qualification Memorandum of Understanding and send it to Stewardship Chair before submitting an application for a Rotary Foundation District or Global Grant. 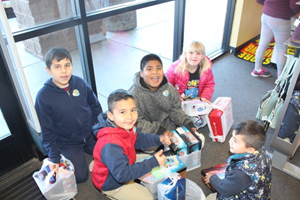 The joint project with the South Tucson Cyber Lions Club to provide shoes to students from Elvira Elementary School took place on Tuesday, February 19. Twenty-five students, accompanied by Tucson Kino Rotarian and Principal of Elvira, came to the Payless Shoe Source at the Spectrum Mall. Robert Stevenson, president of the South Tucson Cyber Lions Club, met them there. On a positive note, each child received not one, but two pairs of shoes and a package of socks. This good fortune for the students was caused by the "Going out of Business" sale happening at the store. Children had their feet measured, then accompanied by a Lion or Rotary volunteer to the appropriate size area. Delighted oohs and aahs were heard throughout the building. One by one, each child chose their favorites and tried them on. Call the Cruise Connection at 1-800-246-7447 to reserve your spot for the 2019 District Conference. All you’ll need is a $50 or $100 deposit, depending on the size of the cabin. The all-inclusive price (excluding alcoholic beverages) will be $404-$409 per person for an inside cabin or $454-$484 for an ocean-view cabin. We sail from Long Beach on Friday, October 25, docking in Ensenada on Sunday, October 27 for a day of active service and wine tasting, returning to Long Beach on Monday morning, October 28. One of Rotary’s most sought-after speakers, John T. Capps, will be with us at our plenary sessions. But the real reason to be part of our “Cruise With a Cause” is to experience Rotary at work around the world, fellowship with terrific Rotarians, and the chance to learn and to develop practical skills to strengthen our clubs. For more information contact DGE Ellie Patterson, ellie@thetempconnection.com. Most of us lament the divisiveness of today’s world. As Rotarians, we’re proud to be working to build peace and mutual understanding. We provide practical skills and the kind of learning that translates into lasting global and local change. Our Southern Arizona Day of Peace on April 6, 2019, will be memorable in many ways. Sessions will be active and experiential, not just lectures or speeches for a maximum of 150 participants including Rotarians, Rotaractors, Interactors, and community members. Leadership will be provided by the Outward Bound Center for Peacemaking in New York City, as well as by local leaders. Stay tuned for sign up information for this exciting adventure in peacemaking! Please send all your articles to: newsletteraz5500@gmail.com by the 21st of each month!